It’s a fact that employees are a company’s greatest asset. What happens, though, when they decide to quit a few months after they get hired? For the call centre industry, this is very common. 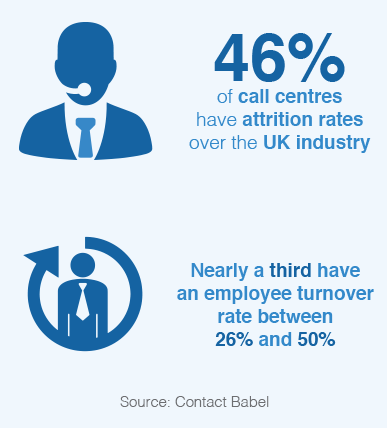 The numbers speak for themselves; call centres deal with a 26% employee turnover annually, whereas the average rate for the UK is 15%. According to CIPD, the average cost for the call centre staff turnover is over £6,000; a cost that reaches £9,000 for senior positions. High levels of stress, excessive demands, unrealistic targets and strict monitoring of performance are some of the reasons why the call centre industry faces such a high turnover rate; consequently struggling with talent shortages, tight margins and pressure on costs and profits. Another key factor is that call centre agents enter the industry keeping in mind that they won’t be around for long; they don’t intend to stay. Managers are also aware of this fact. They don’t expect the employees to be around for a long time, nor do they feel the need to motivate them to do so. On the contrary, they are trying to “use” them as much as they can, push and micromanage their performance and productivity; inevitably burning them out and forcing them to quit. So, the vicious circle of turnover goes on and on. Although a normal turnover can benefit a company, since it prevents employee stagnation and leaves space for labour flow, a high level of turnover is troubling and costly. The financial impact from the turnover, based on shorthand formulas, is between 30% and 400% of the annual salary of an employee. However, the accurate cost of employee turnover is determined by a combination of various parameters. 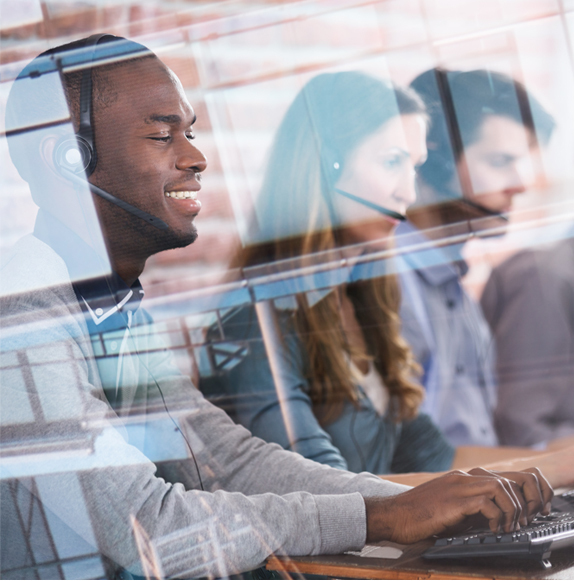 When it comes to call centres, turnover harms a company’s productivity and profitability, especially if those who quit are top performers and long-serving employees. 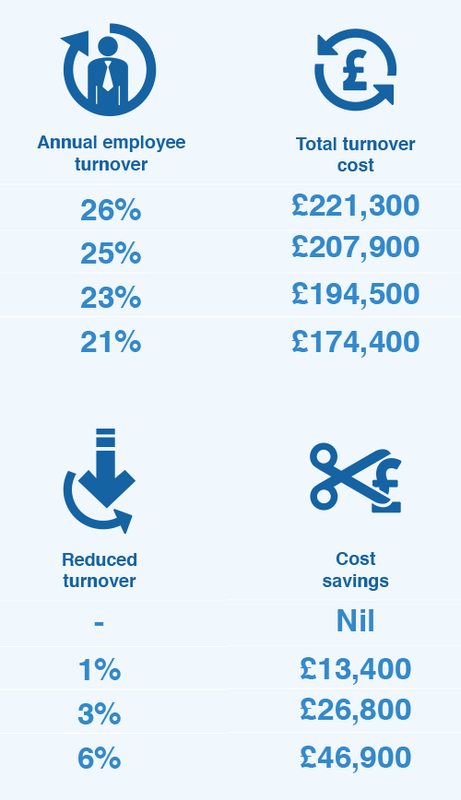 Using a staff base of 125, the table below demonstrates the savings that accumulate for a call centre that reduces the turnover rate even by a small percentage as significant. How could a call centre prevent its staff from leaving? How can this industry attract top talent, retain it and reduce its agent turnover rates? Apart from the usual retention tactics a company could use, such as attractive remuneration packages and opportunities for career advancement… engagement is the answer. Do the employees feel that their skills and experience are valued? Aside from permanent staff, temps also perform better if they feel valued, recognised and cared for. schemes can prevent your workforce from seeking new employers, or at least thinking twice about doing so. Centralus offers a targeted solution to the call centre industry for the ultimate competitive advantage: an engaging workplace that retains top talent and reduces turnover rates. By joining our community, companies gain an array of blue chip perks for employees including 24/7 access to doctors, a confidential helpline as well as discounts on shopping, travel and leisure. Our offer stands for both, permanent and temporary staff, in order to increase loyalty. We also provide workplace pensions so employees can secure themselves a flexible and rewarding retirement plan. CTA: Reduce your employee turnover rate, enhance your business growth and boost performance. and find out how your company can benefit from our collaboration.